The Cubs kicked off their home opener in style this afternoon, hanging 10 runs on the Pirates within the first four innings. Pirates starter Jameson Taillon was on the mound when the Cubs scored the first six, though all of them went down as unearned runs. He lasted just two innings, which was remarkable, since Anthony Rizzo banged a liner off Taillon’s his head that was measured at 102 miles per hour off the bat. The ball appeared to glance off of Taillon’s glove, though he seemed to take most of the force to the head. The Pirates said Taillon was evaluated by team doctors, who said “everything came back normal.” He will be re-evaulated tomorrow to see if there are any lingering effects. 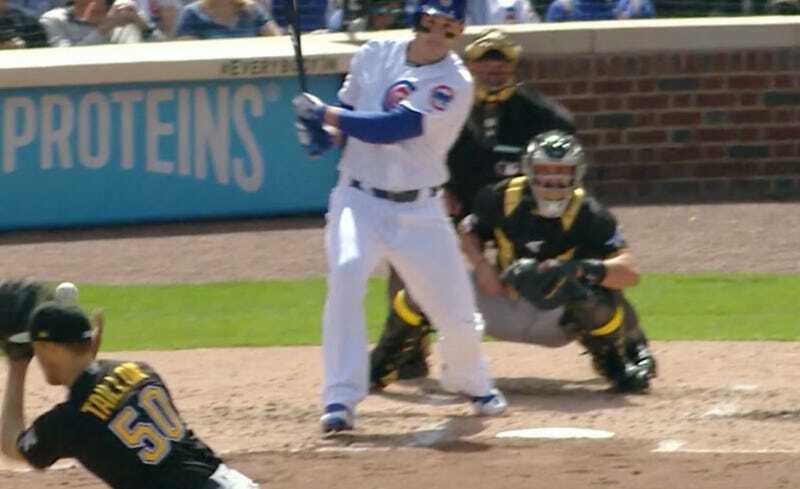 After Rizzo’s single brought in Ben Zobrist, Javy Baez golfed his way to a weird RBI single, then Pirates shortstop Kevin Newman made a throwing error that allowed Rizzo to come home before Taillon finally ended the inning with a strikeout.